I once worked as a proposal developer. I know -- sounds pretty exciting and glamorous, right? Another guy in my group named John often mused about getting away from RFPs (request for proposals) to swim with sharks off the Great Barrier Reef. He also daydreamed about running with the bulls in Pamplona. Last I heard, he was still schlepping binders. An old friend of mine once told me he wanted to become a paramedic paratrooper. Failing that, he considered working on a king crab fishing boat in the Bering Sea. He eventually went to work for an auto dealer as a finance and insurance salesman. 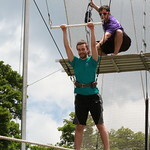 Well, it turns out you can try your hand at the trapeze. You just need to schedule a class at TrapezeSTL, which is now operating behind the Chesterfield Athletic Club at 16625 Swingley Ridge Road in Chesterfield. TrapezeSTL, now in its third season, is part of Circus Harmony, the non-profit organization that uses circus arts to motivate social change. Two-hour trapeze classes are available Wednesday through Sunday. 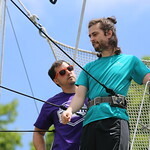 Matt Viverito, lead coach of TrapezeSTL, said the pastime is popular with people who want to stay in shape, learn a new skill or overcome their fears. "Or simply have fun doing something thrilling and unique," he said. "I took classes with Circus Harmony as a kid, so I've been involved with the organization for my entire life. Being a staffer is the next logical step for me. I get to do it in my home town, with my friends!" Beginning trapeze students don't have too much to remember once they get up on the platform. You just grab the bar, jump off and start swinging back and forth. "You don't have to do any thinking," Viverito said. "People approach the trapeze in different ways. If you're feeling brave, you can hang from your knees like on a monkey bar, or you can try a backflip dismount." During a preview of the new TrapezeSTL facility earlier this week, two staffers from the Chesterfield Athletic Club tried it out. Michael Rowan was first up. He said he did some gymnastics in high school, until he hit a growth spurt and got too tall for tumbling. He climbed the ladder to the TrapezeSTL platform and within seconds he was flying through the air with the greatest of ease. Next up was Rowan's co-worker Andrea Randall. She was a former cheerleader at Marquette High School, so she took to the trapeze quickly. Both Rowan and Randall had about a one-minute instructional period from Viverito, so the beginning class is fairly simple. You just get to the platform and jump off. 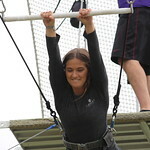 The trapeze netting is just below, so anytime you let go of the bar it's a short fall to a soft landing. When you sign up for a class at TrapezeSTL, you'll be helping other children fly. A portion of the proceeds goes to the group's Wheels to Wings program. It funds transportation for needy and deserving circus students to take circus classes at the Circus Harmony Center at City Museum.